It’s that time of year for soup, hot chocolate, Shepherd’s Pie, and cozy loungewear. And sitting by the fire. Oh, and Netflix. Did I mention I don’t leave my house in the winter? This soup is perfect for cozy, cold winter nights when you’re craving something hearty and comforting yet healthy. Bonus? It requires just 1 pot and around 45 minutes to make! Plus simple ingredients likely lying around your pantry right now. Let’s do this! 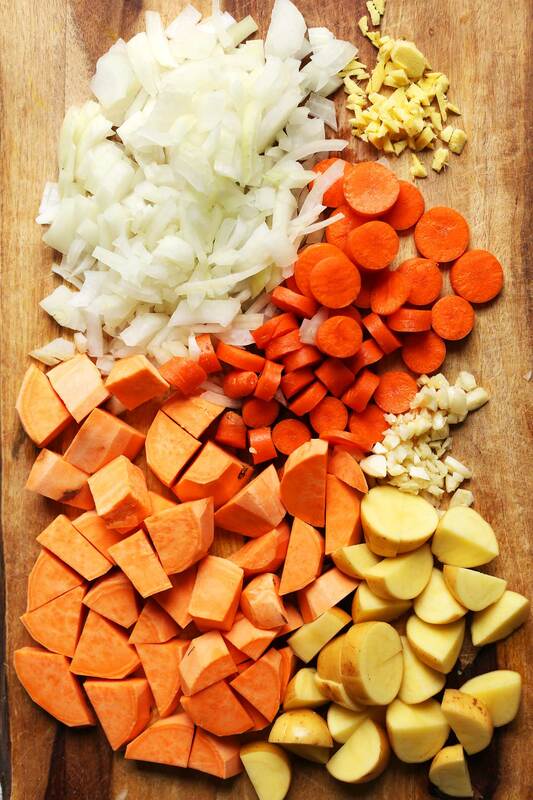 The base for this simple curry soup is onion, garlic, ginger, carrots, and potatoes. Lentils add plenty of plant-based protein and fiber (20 g fiber + 23 g protein per serving). For the quintessential curry flavor, I relied on my DIY curry powder that I’ve been putting in everything lately (i.e. Crispy Tofu, Vibrant Green Curries, and Tofu Scrambles). Last but not least is a generous serving of kale, which is added in the last few minutes of cooking for even more nutrition and a punch of bright-green color. Swoon. Plus, it reheats beautifully, making it ideal for cooking up a batch on the weekend and enjoying throughout the week for quick + easy lunches and dinners. It’s delicious as is, but it would also pair extremely well with my Coconut Curried Greens, Samosa Potato Cakes with Green Chutney, and Garlic & Herb Flatbread! 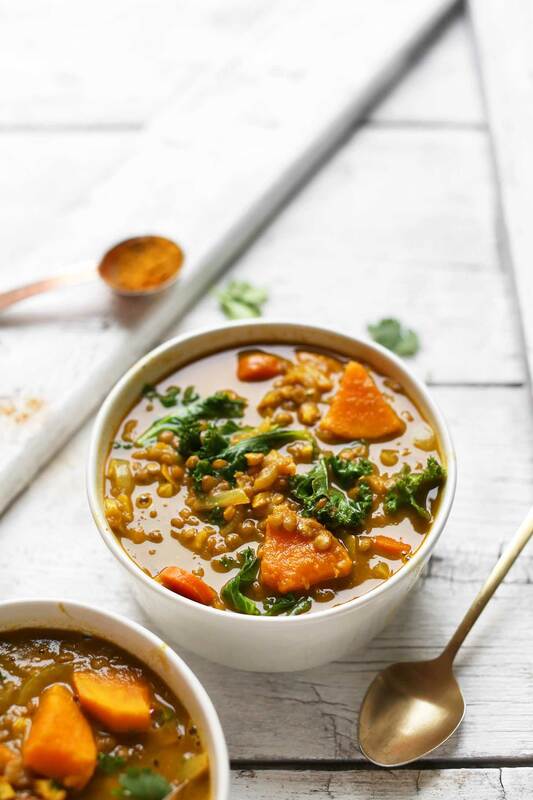 Hearty, comforting curry lentil soup with potatoes and kale! Big curry flavor in this 1-pot soup that comes together in less than 45 minutes. The perfect satisfying, healthy, plant-based meal. Add lesser amount of vegetable broth (5 cups or 1200 ml as original recipe is written // adjust if altering batch size) and increase heat to medium-high. Once at a low boil, add lentils, stir, and reduce heat to low. Simmer for 20-25 minutes, uncovered, or until lentils and potatoes are tender. Taste and adjust seasonings, adding coconut sugar for a little sweetness (optional), more curry powder for intense curry flavor, or sea salt and pepper for more balance. I added more of each. If the soup has thickened too much, add remaining vegetable broth (1 cup or 240 ml as original recipe is written // adjust if altering batch size) , stir, and cook until warmed through. In the last few minutes of cooking, add the kale and cover to steam until tender but still vibrant green - about 2-3 minutes. Serve immediately as is or with cilantro and fresh lemon juice (optional). This would also go well with my Easy Vegan Wheat Bread, or Garlic & Herb Flatbread! Store leftovers in the refrigerator up to 5 days or in the freezer up to 1 month. *If you aren’t into curry, simply omit the curry powder and compensate with a bit more salt, pepper, and a generous 1-2 tsp fresh thyme (amount as original recipe is written // adjust if altering batch size)! This will give it more of a classic fall soup flavor. *Recipe (as originally written) serves 4 as an entrée and 6 as a side. What a beautiful soup! Made the thyme version, with baby spinach for greens, and chopped avocado on top. Delicious. My whole family ate it up, and asked for seconds. Thanks! This soup is now my new favorite. I made it while sick and it has nursed me through the flu. I added a rainbow lentil mix that had some barley and split peas in it too and it was legit. Highly recommend. The fresh ginger really makes this recipe. I made this recipe last night. I ended up having to use only 3 cups of vegetable broth because that was all that I had left and then 2.5 cups of water. It turned out delicious. My partner liked it and had two bowls. Finished the first bowl standing in the kitchen, lol. I figured he would want to add some red pepper flakes to it or something to make it spicy but he enjoyed it as is! Thanks for the recipe. It was a hit. Great! Thanks for sharing, Gerlyn! Delicious. Simple receipe that yields an aroma filled house and satisfied palettes! Delicious and so easy to make! I accidentally chopped too much ginger but it added a nice zing. Thanks for all the ‘minimalist’ recipes Dana. I have your cookbook and it’s my go-to for gluten free and vegan options! This is the second time I have made this soup. I have also used your fab one pot vegetable broth as a base for this. I am using puy lentils today, and brown lentils last time. I have followed the recipes exactly, and each time, turn out delicious. Great recipe. I often use it as inspiration for last-minute dinners when I’ve forgotten to soak some other beans. I also usually throw it together with whatever I have handy (or whatever’s coming out of our garden in bushels): sweet potatoes or squash for the potatoes, red lentils for the green lentils, broccoli or spinach for the kale, zucchini for the carrots, etc. And, of course, as soon as I’m done cooking, I slip into my fuzzy polar bear fleece pajamas, especially when it’s a Portland-esque rainy day in Ontario. Make it now and add some chilli. We are glad you enjoyed it, Natacia! I love this! I used red onion (I didn’t have white), and I used orange and purple sweet potatoes (had no white potatoes) but left everything else the same as recipe. Delicious! I have a question about the kale – have you (or any readers here) heard of a warning to not “heat, cool/freeze, and then re-heat” leafy greens? A friend told me she never keeps any leftover kale, spinach or chard for this reason (and it sounded silly to me) but then I found a few websites which mentioned it, so I was hoping to hear from anyone about the actual science of that idea (rumor? myth? still not sure!). (Guess I could steam some fresh kale when I reheat leftovers). Thanks so much! Is it fine to use pumpkin instead of sweet potato? Made this the other day before my friend came over for supper, and he asked for seconds! This soup is hearty and delicious, like a warm hug :) I also used hot curry powder because I like things a little spicier. Definitely will be making this again soon! Whoop! We’re glad to hear it was a hit! Can this be made in an instant pot? If so what are the instructions. Hi! I found this when looking for some dishes to get more protein in my diet. I put the recipe in my calorie counting app just as it is but only come out with 14 grams of protein, not 23g. Wondering where those other grams are! I don’t want to miss out on them. Do you have some secret high protein veggie broth or something? Great, tasty soup, although the minced ginger made it too sharp for me. But at least the rest of the vegan crowd loved it! I’m not usually a reviewer of things, but I think your website has changed me. How can I not tell everyone how amazing your recipes are?! This soup is so ridiculously easy to make – and ridiculously tasty too! Even my sweet potato hating hubby loves it. I made it with canned lentils, didn’t have ginger or kale so omitted them, and added some frozen spinach for extra greens. Now I’m off to review all the other magical recipes I’ve made of yours. This soup is utterly Delicious!!! I followed the recipe exactly (with the addition of the coconut sugar). No edits necessary! I didn’t make my own curry but used a Hot Yellow Curry Powder I already had on hand. This was so satisfying! I increased the fresh ginger and added celery and red peppers. Delicious! My boyfriend loves it, it’s our new go-to! I LOVE YOUR RECIPES!!! I came down with the cold/flu thing yesterday and this is what I have a taste for… have a big pot simmering now… I will add spinach and peas… I love peas in curried dishes… Thanks for all that you do! Your recipes are what I search through each week when I make my meal plan… i rave about your recipes to my family they love to hear what I’m making for dinner and I just wanted to tell you that you have made me confident in the kitchen. I have always been self conscious cooking even though I enjoyed it. I just always felt like I couldn’t follow recipes because they were too complicated or had ingredients I couldn’t find where I live and rarely something would turn out the way I hoped. Your recipes are delicious, I can follow them (they are clear and concise), they don’t take too long to make and honestly every single recipe I’ve made from you has turned out so delicious that it gets added to my rotation. My passion for cooking has been restored and my confidence has soared! Thank you Dana!!! This recipe is delicious, somewhat surprisingly to me because the ingredients are so simple. I made the recipe with unsalted stock and added no salt, using a mix of potato and sweet potato. It was so flavorful and had nice hints of sweetness, likely from the sweet potato and maybe the ginger. Will definitely make again this season. Thanks for such a great recipe. This was a quick, hearty and easy recipe for a cold January night when nobody feels like cooking. My husband ate his with rice as a ‘curry’ dish but I also enjoyed this as a true soup. We didn’t add any sugar as we found the sweet potato gave this dish enough sweetness. Curry powder can sometimes add a bitterness to dishes if you use too much so I was careful about adding a little at a time and tasting before adding more. Thanks for another delicious and healthy meal! This is my 9189x that I am making this recipe! It so easy! Nourishing, warm, yummy!!! And easyyy! Thank you for sharing this my to go recipe( once a week) ? Don’t tell anyone but I lick my plate after I’m ✅ ?? Hi Angela! We haven’t tried it, but if you do let us know how it turns out! Great recipe! I used red lentils and added half a can of light coconut milk. Perfect for using up some wilted kale. Thank you! Absolutely delicious and filling. Will be making a regular addition to the table, yum! I followed your recipe down to the gram without needing to improvise or add anything, (which is rare for me), & it was perfection. Anyway, thank you for this yum, yummy recipe! It’s perfect for these cold winter days/nights-I’m so pleased. I have pics if you want to see them for any reason, Fyi. I also made your Curry powder recipe for this and that is really great also. Thanks again! Came home from work late, was tired but pushed through and made this soup… Amaaazing! I used regular potatoes only because I had the Mediterranean Sweet potatoes the night before (another fave of minimalist bakers) and used spinach instead of kale because Its what I had. Defreakinglcious! Going to be making this one frequently. Can I freeze this? How long will it last if I do? Hi Joan! Store leftovers in the refrigerator up to 5 days or in the freezer up to 1 month. This was so comforting, easy, and delicious!!! I highly highly recommend it! I love the combo of reg/sweet potatoes (I used yukon gold b/c they’re the best). I also added some chopped celery since I like adding it to soups/stews. I topped my bowl off with nutritional yeast which made it taste even better. Thank you so very much for making and sharing your awesome recipes. This was so comforting, easy, and delicious!!! I highly highly recommend it! I love the combo of reg/sweet potatoes (I used yukon gold b/c they’re the best). I didn’t have ginger so I used ginger powder and I also added some chopped celery since I like adding it to soups/stews. I used a madras curry powder blend by Sun Brands; I recommend it. I topped my bowl off with nutritional yeast which made it taste even better. When eating the leftovers, I might consider adding a touch of lemon/vinegar (acid) when serving to brighten it up! I Made it and used by immersion blender and made it thick like a chowder. Delicious! Soooooooo goood!!!!!!!!! Probably my favorite soup now, honestly. Lime and a dash of salt & pepper, DELISH. Perfect for those nights in. I made this soup this weekend to eat on during the week and I have to say, I love it! It is one of my favorite soups and it’s so healthy. I omitted the ginger…I don’t like it, I also didn’t add the kale because I forgot to buy it, but otherwise I stuck to the recipe as it was written. I will be making this soup multiple times this fall/winter season. I’m so glad I found this recipe! Do you think it would be good if I subbed cauliflower for the yellow potatoes? Excited to make this tonight. Hi Sarah! We haven’t tried it, but if you do let us know how it turns out! I made this last night and it’s fabulous! I might want to make it every week. I went a bit nuts with the kale because I had extra; it was so yummy. I added a little bit of nutmeg and dried parsley. It is a perfect soup. Thank you!!! I love this recipe! I’ve prob made it 3 times now. This is nice with butternut squash or a can of coconut milk for extra creamyness. I have been following your website/instagram religiously since I was plagued with multiple different food sensitivities/allergies back in April of 2017. Since then I cannot tell you how many recipes we have used, it has to be over 30, and we have NEVER made anything we didn’t enjoy! BUT, I think this is one of the top 3 we have made, I cannot believe how flavourful it is without being unhealthy!! We did make a small change though, we roasted the veggies for 45-50 min at 425C, so I guess we kind of mixed two of your recipes into one super dinner. Thanks for everything, you have really helped me through tough times, you gave me hope when I was overwhelmed with finding foods I could actually eat that were healthy and yummy! I finally have the courage to cook as fearlessly as I did prior to being told about my food intolerances, and I am forever grateful to you for that. Thanks for the great recipe. This looks great. it’s rainy and cold here and the perfect time for this soup, I will make something like your soup for my boyfriend soon.I hope he is gonna like it. Absolutely delicious… and it’s vegan!! Soooo good… I’ll be making this dish again soon.. yum! I made this soup with the flatbread and it was an amazing combination. I used my slow cooker. I threw all the ingredients except the kale into the pot and cooked on low for 3 hours. I threw in the kale for the last 15 mins. This will be a new go-to recipe. Just made this and am super excited to taste it! I love your recipes. I am Just wondering if anyone has blended it, and whether you’d recommend it blended or eaten as is? This was wonderful!! Even my kids aged 2 and 3 devoured it. It has officially made the weekly rotation. I made it as stated except I used spinach as that’s what I had on hand and I did add the coconut sugar. It’s super flavourful and I love the healthy ingredients!! I used half sweet and half regular potatoes. Thanks for this!! It really is perfect!! I also added a bit more garlic, didn’t use any sugar, no cilantro and squeeze lime vs. lemon juice when served. Turned out really well. I am trying to eat more plant based and would’ve done w/ veggie broth, but I’ve got a bunch of cartons of Pacific bone broth that I don’t want to waste, so I opted to not make this dish vegan. I am by myself, so will have PLENTY of left overs for the week. May have to freeze some, but that’s just fine. Made great leftovers. Added avocado when served and was great! Towards the end, also added a bit of brown rice and was great! Thank you so much for all your recipes. I’m always on your site making one thing or another ? I love this soup so much, it’s so delicious and easy to make! This was super good !!! The only thing I changed was the Kale( not a fan ) in which I used Collard greens. It turned out aHHHmazing, boyfriend said it was the best soup he ever had! I’ve made this several times now and it is absolutely delicious. It turns out well when the recipe is doubled and can be frozen and reheated without issue. I usually make it with red lentils and it is perfect; it’s not as good with the green lentils. Will continue to be a staple for me! Hello, due to healthy concerns I have recently cut out gluten and dairy from my diet. I was recommended your site from a friend and it was like discovering a treasure trove of goodness!! Thank-you so much for all the amazing post and recipes! I’m really exited to try more vegan recipes and make some delicious food with heart and soul. soup, in the sense that although it seems heavy it’s not. You’ll feel somewhat full after, but it’s a good kind of full, nothing like bloated from eating unhealthy junk food. I like curry, and it’s a soup you can make all year-round. This is killer diller Dana. Six stars out of five. About to share it with my son. I followed the recipe exactly. Mine turned out terrific and my husband is still eating it. I used curly green kale. A white onion. Green lentils. I used the sweet potato/golden potato, and I used The Hot Curry Powder from The Spice House . I used Imagine No Chicken broth, which I think is the best for soup. I think the other secret is I used a fresh Meyer lemon to squeeze on top. I think the citrus really tops this dish and the Meyer lemon has the perfect balance of sweet to tart. This soup is super tasty and easy to make. I did tweak the recipe a bit though. I used half coconut milk and half veggie broth for a richer sweeter flavor. Also, I left out the kale. I made this recipe and it is delicious! My boyfriend is in love with it and insists that it become a staple in our household! HOLY COW! I literally just made this (currently stuffing my face) and I have to say, this will now be my go-to soup! Full of flavour and the kale definitely adds that crunch. I haven’t made anything else from your recipes but I am definitely making more of an effect now!! Thank you!! Warms you from the inside out. This soup is one I have come back to all winter when it’s too cold to want to eat salads with frequency. The recipe is forgiving in that I throw in more potatoes than what is called for and am not terribly precise with the curry powder spices. It’s come out great every time. Making this for dinner tonight, second time around – so, so very good! I did not have kale so added frozen spinach during cooking and used parsnips instead of carrots (didn’t have any the first time around) and it turned out beautifully. I made a huge pot of this today. I gadded red lentils in addition to the green lentils and garbanzo beans as I thought those sounded good with curry. I also thickened the broth with a few tbs of brown rice flour. This is way yummy! Thanks for posting the recipe! I also appreciate the homemade curry recipe as I might use going forward. *Added. I added red lentils. Shouldn’t type without glasses. Anyway, I took this to a chili & soup contest at work last month and won “Healthiest Chili or Soup.” I’m making another batch tonight. Works great with left over veggies. I made this and it was fantastic! I added about a cup and a half of butternut squash because I had it and it worked nicely. We had leftovers Hooray! And when my husband reheated ir, he added a bit of blood orange olive oil we happened to have, a gift from my sister… What an excellent adition. The citrus really added something special! Great recipe! Thank you!!! This looks so delish! I have an instant pot and would like to copy this recipe using it. Could you please help me with the specs cooking it in an instant pot? This recipe is the bomb. I made it today and it is absolutely delicious. Thank you so much for sharing this simple and delicious recipe! I’m really proud of myself for making something so flavorful and different from what I usually whip up. I was so excited that I had to share it on my Instagram (frugalurbanfittie) :-) Will definitely be making this again before Spring. Made this last night, it was amazing! I added cumin and turmeric in addition to the other spices. Added a can of unsweetened coconut milk at the end too, that really made it yummy and delicious. Overall, great recipe! Will definitely save for later. Just made this for the second time in three weeks, we love it! I enjoyed making this stew because it’s simple and really does reheat beautifully. I never made curry powder before and I can’t even remember the last time I ate curry anything, so this was fun. It’s gonna be a staple. I wasn’t feeling it when it was all coming together but I changed my mind upon the first bite. I’ve never said this on a cooking site but your ideas are so talented. This recipe sounds so delicious! How can I make it in a slow cooker? Hi! I haven’t tried using a slow cooker for this one, but if you are going to give it a go, I would suggest cooking on low and adding the kale just before it is finished! If you give it a try, let me know how it goes! Good luck! Loved this recipe! Very easy and super tasty soup! Love the lentils for some protein! I’m sick but when I got a little energy I made this soup. I didn’t follow it exactly because I didn’t have energy to keep referring back to the recipe but I got the idea. The soup came out good. Nice job! I’ll make this again. I used the recipe exactly and it was amazing! I love this recipe because it’s easy and convenient to make. As a student I also focus on shopping groceries in a smart way: the ingredients used here are affordable and usable for various other recipes, so I am never left with “too much” I cannot use otherwise. Recently I made this soup thicker so it’s more of a stew and easy to take with me to work with good slices of self-made bread. So comforting, warming and tasty! Do you think it would be just as nice “whizzed”? We have an 18mo who is awesome with the spoon but different sized ingredients are a challenge. It still turned out amazing! This was so AMAZINGLY GOOD!!! :D I’m not sure if green lentils are the same as French lentils (which are also green??) – either way, it still worked!! No kale on hand, so we popped in a handful or two of spinach at the very end. Love how fragrant/spicy this whole dish is, definitely a new favorite! Hi Carrie! Glad you loved it! Green lentils & French green lentils are the same so you were good all along! Thanks for the comment! We had a cold front blow in last night, and this recipe couldn’t have been more perfect! It was simple, savory, and spicy (and super inexpensive to make as I already had all the ingredients on hand). I made it for myself and two other people (who are not vegetarians), and we all loved it! We enjoyed with toasted naan on the side. Really fantastic and hearty meal! I made it, as suggested, with half potato and half sweet potato – FYI the sweet potato cooks much faster than the potato. I found that because I threw them both in at the same time the result was some very soft sweet potato. I had no problem with this. I served it with brown rice. Will make again. Had a friend over for dinner last night and made this. I was hoping it would help battle the 25 below weather we’re currently having. He could not stop eating this. He was all skeptical because it has no meat and is full of kale but after eating it, was surprised how substantial it was. Slowly turning my circle towards more plant based eating, one person at a time! Anyway, I made it with red lentils instead of green and the leftovers are now this amazing, thick, stew. Which is totally fine by me. Thanks for the recipe Dana. They’re always great! I absolutely loved this soup! It was super simple and incredibly tasty. I will definitely be making this again soon! Loved this recipe, I made it with the thyme/Rosemary naan bread and it was delicious! Incredible soup, love everything about it! I made this last night and loved it. Super easy, healthy and delicious. Thanks. Made this tonight. Used leeks instead of onion and dried Kale from last year’s garden. Used a little less curry because my kids don’t like strong curry. It tastes great. Love the combination of curry/ginger/coconut sugar. Lightly sweet and warm and a bit spicy. Perfect balance. Wondering what it would taste like with fresh greens next time. Could definitely use the leftovers on rice. I’m about to make this, adding kale in this soup sounds great, but I have a few broccoli crowns that I want to use before they spoil. If I use broccoli instead, should I still add it at the same time as I would the kale, or would it require a little more than a 3-minute steam? Used Red Lentils instead of green and it gives it more of a hearty stew vibe. Good curry flavor and I think the Kale is great and adds a lot to the overall texture. Was worried it would turn out slimey but was just right. I made the soup and it was just perfect blend of everything. Here the temperature was -28’C in the morning, so it was really nice to eat that lovely warm soup. I made this yesterday and omg, it’s delicious. 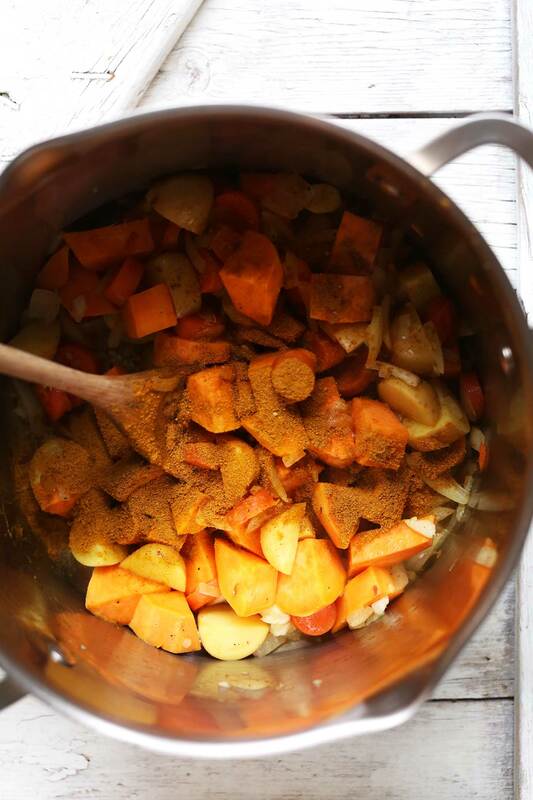 The flavor is so rich with your curry spice blend. Will definitely be making it again. The only thing I changed was to use water in place of vegetable stock to reduce the sodium content. Thank you, Dana! I just made this for dinner (with TJ’s Curry Powder and TJ’s Ginger Paste), and I’m enjoying it so much. I love starchy soups. I didn’t even garnish with lemon or cilantro, and it is fab. Even the hubs gave it two thumbs up. Excellent recipe! 5 stars for certain btw! I made this, but also added hot curry powder, mirepoix, and cubed butternut squash’ ABSOLUTELY amazing! Added to my recipe book already! just made this today to warm me up on a wintery sunday and it came out AMAZING! i am definitely going to hold on to this recipe and i think it could easily become one of my favorites. Its so cold and dreary in the midwest right now and I’ve been compensating by drinking too much coffee and making lots of soup. This recipe is definitely a keeper! My entire family approved (even my picky 6 year old). I made this recipe exactly as it’s written; I did hesitate at adding the coconut sugar but decided to go for it and boy was I glad I did. So delicious and savory, great balance of flavors…its a straight up taste-bud party. Thank you so much for sharing! It is a perfect soup for everyone. My family and I loves it. Thanks! Every recipe I have tried from you has been a hit and this soup was delicious! I made a double batch of this today. It’s my husband’s birthday and it’s freezing outside and snowing. It was the perfect warming soup to come into after sledding with the kids. I used my homemade chicken stock instead of veggie broth but that was the only substitute I made. We all loved it and I am thankful I have more in the fridge for tomorrow! I just made this and it is delicious!! I didn’t have coconut oil so I just used butter, but that was the only tweek I made. I did top with some freshly grated Parmesan. I gave it to my one year old daughter for dinner and she loved it as well! Thanks for the great recipe! Do you think I could sub some of the veggie broth for coconut milk? I like the healthy soups but my husband likes the rich, fatty ones. I made this last night and it was wonderful! I added more curry powder than called for and followed Dana’s suggestion of using sweet potato and a yellow potato and it was SO good! Super easy, quick and all in one pot! 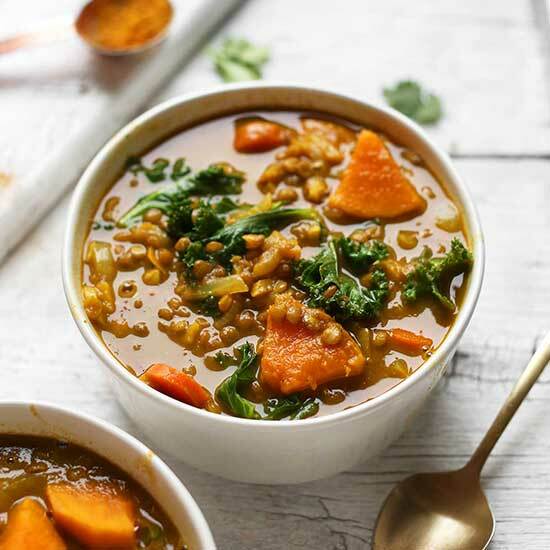 For those of you who don’t like lentils or kale, I would urge you to try this recipe as written as the flavors and textures are really wonderful together. I think some recipes have us overcooking lentils and under or overcooking kale so that they seem not-so-great but this is spot on with these ingredients and instructions! I recently discovered Minimalist Baker and am HOOKED! Everything we’ve tried has been easy and super delish not to mention healthy for our (primarily) plant based diet. Thank you! I made this yesterday. It was delicious and my 2.5 year old asked for seconds! First of all, I love all your recipes Dana! I finally got your cookbook for Christmas and it’s been so fun cooking with an actual book now (I have a journal cookbook where I write down recipes I love and most of them are yours anyways LOL). My digestive system was feeling pretty sluggish after this holiday season…when I ran across this recipe I realized I had everything I needed for it already! I had fresh turmeric and ginger on hand so I added a lot of those as well (cubed some up and put them in as it was cooking to really flavor it well) and it was delicious! Sluggish no more! 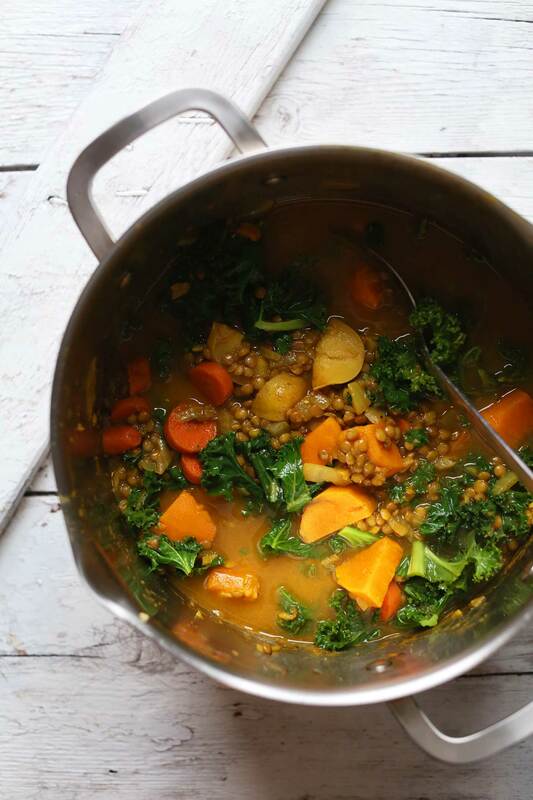 This soup put me back on track to healthy eating and is so yummy in my tum. I made this but used some Le Puy lentils. I like green lentils but I like the Le Puy green lentils best as they hold together better in soups and any lentil dish, and have a distinct flavor. You can get them online or at better specialty grocers. Thanks for the awesome recipe! I made this soup last night and it is absolutely delicious. I am having leftovers for lunch. Thank you for sharing this recipe. This soup was wonderful! It was so perfect for dinner on a snowy day. I used Penzey’s curry powder because it’s what I had on hand, and I also used some brown tepary beans also because I had them on hand and am somewhat lentil averse. I cooked them beforehand because they have a much longer cooking time than lentils. I would agree with the idea to garnish with some non-dairy yogurt. Thank you for a yummy dinner. This soup is AMAZING! It’s the perfect winter soup, hearty and spicy. My favorite part of this recipe is that even where I live in rural northern Japan, I can easily find all of the ingredients. Thank you for posting this wonderful recipe! I want to make this but the directions only indicate to use a large pot. Everyone’s interpretation of large is different. It would be more helpful if you could specify the quart size or litre size of the pot. Thanks so much. Hi Sabine! It honestly doesn’t matter. I use a 6 quart pot. But a large saucepan would work, too! I just made this and it was seriously delicious! I used baby spinach instead of kale (because I hate kale lol) and it went great. On raining day, I decided to make this with little adjustment. I liked it and now I have to wait and see i my son (18) and daughter (15) like it too. I’m crossing my fingers. I also liked the idea of 10 or less ingredients and spend less time cooking and prepping. Are the lentils already cooked before you add to the pot? No, just clean and drain them and add to the pot. They cook perfectly! Hi! Nope – dry lentils! Happy cooking! It’s been rainy and cold in the Bay Area today which means one thing…soup time! Stopped at TJ’s to pick up essential ingredients, prepped everything in advance and was enjoying a bowl (who am I kidding…I ate 2 bowls!) of this fabulous soup within an hour! The aroma of the veggies sautéing in the coconut oil got my taste buds anxious for the soup to finish and it was worth the wait. Can’t wait to have it for lunch tomorrow… I imagine the day after it’s even better! TY for a terrific recipe! Yumm. Teens approved! Improvised with no potatoes, no carrots and I only had red lentils on hand. Wasn’t as thick as I liked so I cooked 1 extra sweet potato in microwave and mixed in at the end. SAVORY! I made this tonight, and it was great! What really kicked it up was a dollop each of coconut yogurt and mango chutney on each serving. Very easy, hearty, and filling. Is it possible that to use crockpot? If so, are there any changes in the recipe? Hi! While I haven’t tried this recipe in the crockpot, it should work! If you give it a try, let me know how it goes! I’m sometimes confused about the names people use for brown and green lentils. I think of green lentils as the small ones also called French lentils, but your photos look like the larger brown lentils. I’ve found that the cooking times are different, so which did you use? Thanks! The recipe’s time would definitely suggest brown lentils. Source: I used green lentils and it took close to an hour to get them tender. Correct. I should have gone with my instinct and added the lentils earlier, or at the very least read the package. My green lentils state 30-45 min cooking time. I think I ended up having to simmer the soup for 50 minutes after I added the lentils. I made this last night. It was pretty good. I think it would actually be even better slightly blended and/or with more veggies thrown in. I think I’m going to add some spring veg to my leftovers. You are totally right it certainly appears to be brown lentils shown yet green lentils called for. I have found brown lentils break up and make a thicker soup whereas green (french) lentils hold their shape. Additionally, I went to 3 stores to find the green lentils where all my grocery stores carry the brown! IJust made this soup for dinner, added some red chard as I didn’t have kale. I can’t stop eating — this soup is so delicious! Just made this in my instant pot in 15 minutes, added 3 big handfuls of baby spinach after the pressure released because I didn’t have kale. It’s delicious and filling! Deeeeeelicious! I love this simple soup recipe. I had everything on hand, so I made it tonight. The only thing I added was a bay leaf, and parsley instead of cilantro. Winning recipe for sure! Just finished making this soup and it’s DELICOUS. I had red lentils on hand, so I used them instead of green, and then puréed it at the end (easier for my little one to eat). Really an amazing soup. Thanks! Best soup I’ve ever made! Absolutely delicious!!!! Thank you! Delicious! I appreciate all the cooking details in the recipe, I feel like those are often missing but so crucial. Will make again, thanks! Picky lentil eater over here; do you think red lentils would work as well as green? Thanks in advance! I do! Red lentils just get softer and cook faster. So keep that in mind! I used red lentils and added them near the end so not so mushy. Your recipe was absoutely amazing and a smash hit! I’m making this right now and omitting the curry because of my kids. Should I still use the ginger? I don’t know how I can be related to anyone who doesn’t like curry!? Hi there! I would say if you’re omitting the curry powder to also omit the ginger and go for a more “classic” soup/broth flavor. Good luck! Give your kids the experience and discipline of trying new foods; it’s one of the things I now, at 25, have begun to see the benefit of. I would suggest you also them involved in the preparation and cooking, whilst only changing perhaps the amount of chilli rather than the complex array of flavours spices provide. Give them an appreciation and respect of food from a young age and they will thank you for it down the track. In my own case, having tried and experimented with spices I have grown to love them, similarly with fermented foods. Meanwhile, my friends shun them because they’ve never had an ‘inclination’ to try them, and so just buy/eat burgers, fast/processed foods, and ‘safe’/familiar options. You’ve offered beautiful advice. Thank you so much for sharing your honesty! I only began experimenting with foods from a “experiential” standpoint and I’m 29 years old. I’ve discovered new flavors and don’t rely on the not-so-good comfort/safe options I’ve grown accustom to. I’ve also invited my 11 year old goddaughter to live with me and she has been inspired to try new foods and learn about others. After many talks and lots of research together, she is beginning to banish old habits and gain appreciation for more authentic foods, fruits/vegetables, natural spices/herbs, and (added bonus) decided to adopt a pescatarian lifestyle and working toward plant-based. While she’s only in the preliminary stages, I’ve found that rather than settling on “this is what she likes and is used to,” but giving her exposure to different foods and the cooking experience, she is more receptive to trying new things. It’s a new journey for us both, but your post is spot on. It’s definitely better to learn and have the exposure to food sooner rather than later, and also learn to appreciate food as a source of nourishment and energy for our body. Back to the recipe – I’m trying this today but would like to use my Instant Pot. Can’t wait to try it!!! Thanks for posting, Dana! I always forget how much I love lentil soup until I amke a big pot of it. This version sounds delicious! Hi! I think green beans or collard greens would be great in this soup. Even broccoli or cabbage. Good luck! I made it with chard last night and it turned ot beautifully. I like kale but didn’t have any on hand whereas chard grows in our garden! Makes a very decent alternative to kale. I used arugula and it turned out stellar!! Looks good! 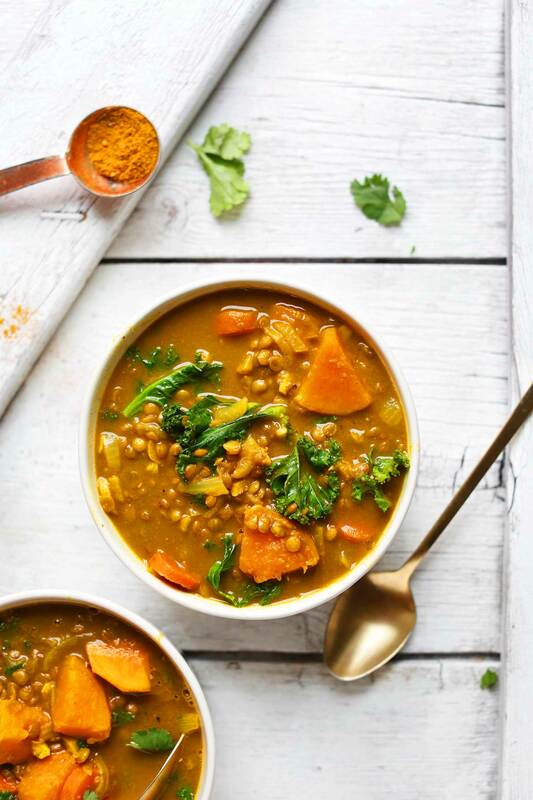 Kind of reminds me of Pret”s moroccan lentil soup, have you tried it? Can I use some other green vegetable instead of kale? What would go well? Also is there a way to make this a lower sodium dish? Thanks! I haven’t! I think green beans or collard greens would be great in this soup. Even broccoli or cabbage. To make it lower sodium use low sodium veg broth and don’t add any extra salt! Compensate with more curry powder and lemon juice. Good luck! With a massive head cold, I’m hoping I can get either my wife or my mom (okay, going with my mom on this one) to make this for me. Ginger is just your BBF when sick. Looks super. This looks so amazing! Yup, I have all the ingredients. I’m going to make it in my slow cooker tomorrow and come home to deliciousness. Can’t wait!